The Pittsfield Rotary Hot Air Balloon Festival (Pittsfield Balloon Rally) is a large and well known event in New Hampshire that takes place at Drake Field in Pittsfield. The Hot Air Balloon Festival has also been known as "The Balloon Rally." Which usually takes place the first weekend of August every year. The Balloon Festival brings visitors from all over the New England area into the small town of Pittsfield, NH. and is a great event for the entire family. The Balloon Festival includes rides, food, hot air balloon rides, helicopter rides around the Pittsfield area and of course the launching of the hot air balloons which occurs Friday evening, Saturday morning, Saturday evening, and Sunday morning most years (weather permitting). Wind plays a major factor in deciding if the hot air balloons will be allowed to launch. Even the smallest amount of wind can ground all of the hot air balloons. Whether to launch the Hot Air Balloons or not is sometimes decided minutes before the scheduled launch of the balloons. 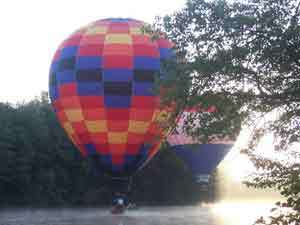 During perfect weather, the hot air balloons are able to "dip" into the Suncook river as shown in the photos of the Pittsfield balloon rally. The morning launch is by far the most exciting for many early risers and provides the best chances for launching the hot air balloons as the wind is calm. It also provides a great opportunity to take beautiful photos of the hot air balloons. The photo on the top of every page of our website was taken at the Pittsfield Balloon Festival. Check Out The Live Pittsfield Hot Air Balloon Rally Cam! The Pittsfield Rotary Hot Air Balloon Festival (Pittsfield Balloon Rally) is a large and well known event in New Hampshire that takes place at Drake Field in Pittsfield. The Hot Air Balloon Festival has also been known as "The Balloon Rally." Which usually takes place the first weekend of August every year. The Rotary Balloon Rally will be open rain or shine. We have a list of activities but not an exact schedule because the times are subject to change due to safety, weather, and operational requirements. Smoking is NOT Permitted. Drones, Bicycles, Skateboard and Dogs are NOT Allowed in the Park.